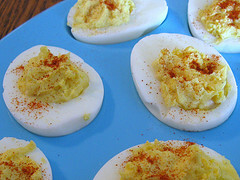 My friend Pam who gave me this Stuffed Eggs recipe claims they are the BEST EVER, and after having them, I agree. Try this recipe for your next party, they will be a hit. Be prepared to give out a copy of the recipe, your friends and family will request it once they have them. Remove yolks and mash. Add rest of the ingredients. Mix thoroughly and fill the whites. Sprinkle with the Paprika. Tip: To boil the perfect egg, start with cold eggs and put into pot with cold water at least an inch over the top of the eggs. Bring to a boil point and reduce heat to simmer. Simmer for 10 minutes, take off heat and let sit in hot water for 10 minutes. Run cold water over them and put in refrigerator until ready to use.